you time and money while maximizing efficiency. with this cloud-based automated replenishment solution. You Spec it, We Source it. Falcon simplifies the management of low-value production components to mitigate risk, reduce the total cost of ownership and ensure maximum production uptime for our OEM customers. With our extensive supply base, Falcon can source any fastener or Class C component you want, even made-to-print parts, and we ensure quality and competitive pricing. Our Reliable StockTM vendor managed inventory (VMI) programs are customized to your preferences for ordering, receiving and stocking inventory. We offer kitting services as well as subassembly in addition to all of our cost reduction services like local delivery, vendor and invoice consolidation and more. A dedicated account manager will research your best supply source, manage your inventory levels, and search for cost savings. 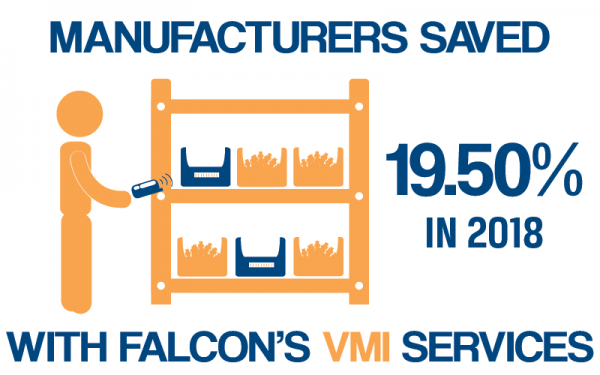 Falcon Saves Equipment Manufacturers 19.50% in 2018! Falcon Saves Equipment Manufacturers 16.37% in 2017! Falcon supplies fasteners and inventory management services to manufacturers in North and South Carolina, Kentucky, and the surrounding areas.